Here’s our fantasy premier league best fixtures GW26 article with the GW26-30 fixture ease schedule. 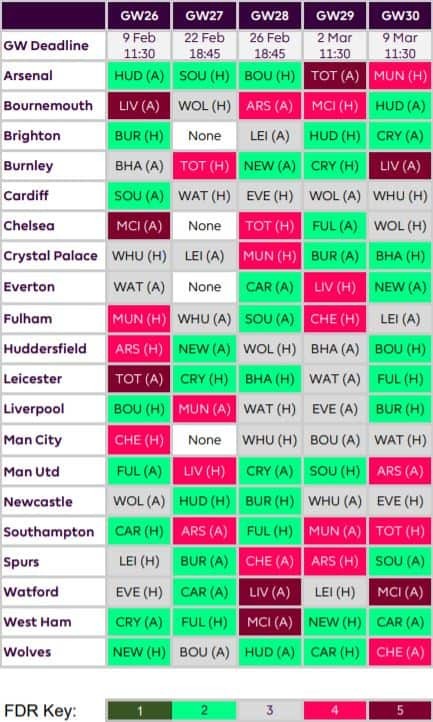 We look at the teams with the best fixtures from over the next 3 and 5 gameweeks There’s also some player suggestions with their basic stats and their upcoming fixtures. We’ve also added good fixture clumps at the end for you to be aware of before transfers in and out. GW27 is the weekend of the EFL Cup final between Chelsea and Man City. Chelsea and Man City plus their opponents Brighton and Everton respectively don’t have fixtures in that week. The schedule reflects that. Here I give attacking and defensive player suggestions for players with good 5 week and 3 week fixtures. This week we’re looking at Wolves, Newcastle, Cardiff and Man Utd. £6.7m Fwd Jimenez has scored 9 goals and 7 assists in 24 starts plus 1 as sub at a PP90 of 5.4. He has been a consistent returner. Of the defenders there are 3 options. The premium attacking option of Doherty at £5.3m, the cheaper and less productive attacking version of Jonny at £4.3m and the very cheap option of Bennett at £4.1m. £5.7m Fwd Rondon has scored 6 goals and 3 assists in 17 starts plus 2 as sub at a PP90 of 4.9. Now that Paterson has gone from FC to RM then there is no attacking player. Niasse is a player I like but at the moment he’s played 3 games with only the recent Bournmouth game producing any attacking output. I personally would want to see more before taking the plunge. Defensively in the absence of Morrison I would go for the £4.6m Bamba or the GK Etheridge at £4.7m although there defensive record is pretty poor to say the least. Only Fulham have conceded more goals and only Burnley and Fulham have a cumulative worst xG conceded. £7.7m Fwd Rashford has scored 9 goals and 7 assists in 17 starts plus 4 as sub at a PP90 of 6.1. £8.6m Mid Pogba has scored 9 goals and 9 assists in 21 starts plus 1 as sub at a PP90 of 6.2. He also has pens. £5.0m Luke Shaw is still the best defensive option for me although £4.9m Lindelof has started all of the last 9.